Topher just had his 9-month checkup and he's doing great! He's about 50th percentile for height (28"), 50th for head size (18"), and 90th for weight (22 lbs). You would never, ever know that he was a preemie. He's alert and interested in everything around him, and he can scoot and crawl and babble. We're so proud of everything he does. Tomorrow morning we'll be waking up around 3am so we can shower, pack up the car, get our little one ready, drive to Des Moines, and park our car at the airport in time for our 6:05am flight out to Utah for the big Berbert Family reunion (my mom's side). We are still a little nervous about the almost 3-hr flight to Salt Lake, followed by a 2.5 hr drive up to Bear Lake, but once we get there, it should be a lot of fun. Topher even got a brand new "big boy" seat that we'll check as baggage (no charge for baby items checked, courtesy Delta) and then install in our rental car. It's a lot bigger and roomier than his infant car seat, and he seemed pretty excited when we tried it out in the living room yesterday. TJ had a "Transformers" birthday yesterday. Topher especially had fun when he got to "sign" his name on daddy's card...I guess he got a little carried away by the excitement of me allowing him to hold the pen all by himself. The theme will be completed tonight when we finally go to see Transformers 2...the last new movie we saw was Marley & Me and the parking lot was covered in ice that night, so it's been awhile. Our neighbors across the street offered to babysit last night and we were able to meet our realtor and see a few more properties, but each one confirmed the fact that we love that Greenview townhome (see last entry) , so we went ahead and put a bid in on it. We have very low expectations of coming to an agreement with the listing agent (he seems a little sketchy) but at least now we can say that we tried. TJ's birthday celebration continues today as he will go golfing with his dad and then his parents will take Topher while we go to our movie. I didn't get him anything exciting for his birthday (just a Transformer toy because he loves them, despite the fact that he's a "grown up" now) but his real present is that we're saving up to buy him a PS3. He's very excited about it. In selling news, the buyers for our home had their inspection and everything went off without a hitch...they didn't even ask for another penny, even though the roof needs to be replaced soon, so we were thrilled about that. So now we just wait while the loan is being processed and everything is finalized, which will take several weeks. On the buying side of the equation, our realtor told us not even expect a reply from the listing agent on our townhome offer, but we're hoping that our "birthday bid" carries some good luck with it. We're not holding our breath, but our fingers are crossed. Wish us luck! I have no idea if we'll end up putting an offer on this one or not. We just got pre-approved, though, so we are ready to make an offer once we are sure about which townhome we want. The buyers for OUR house are doing their home inspection today, so hopefully everything goes well with that. Good news! No, GREAT news: we accepted an offer on our house this past weekend! The couple walked through on Friday and were scheduled to walk through again on Monday, but must have gotten anxious because they called Saturday with an offer. After an initial low-ball offer and a few back-and-forth negotiations, we settled on a price that we're pretty pleased with. If you had told us a year ago (let's see...a year ago we were still living with the in-laws and our house was stagnant and echo-y because we had no walls) that we would sell this house for a profit, I would never have believed it. It sounds like the inspection is going to happen tomorrow and hopefully all goes well. We don't anticipate any big problems. The buyers are pre-approved, so we hope the loan process can go smoothly and that we can keep our tentative closing date of August 27th. Are we waxing a little sad and nostalgic about leaving our first home? Umm...no. Not at all, no. And just in case I am ever tempted to, all I have to do is get out this picture and suddenly I remember just how lucky we will be to be able to walk away from this place. This was my last glance downstairs before wading out into our yard the night of the flood. 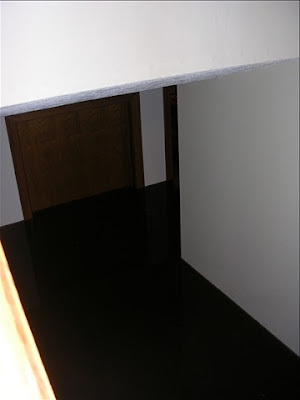 As you can see, the water is nearing the top of the doorways. INSIDE our house. It's so bizarre. That picture always makes me feel positively nauseous. And that's how I know that we're doing the right thing. This was always a very nice house, but it was never our dream home. Even though there's technically a lot of square footage here, we don't have as much usable space as you might think (especially now that we don't use the downstairs at all except for TJ's weights.) The three of us all share one bathroom and now with Topher crawling, we could use a little more carpeted space (we have zero carpet upstairs). I actually have a list of about a hundred things I will NOT miss, and of the things I WILL miss, I can only think of three: the trees we planted, the fenced yard for Sassy, and being so close to TJ's parents (who have a very special bond with Topher). Now that we have an accepted offer, we are free to look and even put an offer on a new place. There are a few townhomes in Ankeny that we are very excited to look at. They seem to have a lot to offer--attached 2 car garages, 2.5 bathrooms, master suites, walk-in closets--a lot of amenities that we don't currently have here. KC was a blast. The car ride there and back was a very specific kind of torture, having to watch Topher be so miserable, but it was so much fun once we got there. Poor Topher just hates being strapped down. How would YOU like to look at this face for 3 1/2 hours?? It's so heart-breaking. I hate it. Even with frequent stops, he's fine the second we take him out and miserable the second we strap him back in. We stayed with my sister Regina, her husband Justin, and their two girls Audree and Juliette. They have a brand new house in Olathe, KS that is just gorgeous and we got to stay in the "pink princess" room (Audree's) and it was beautiful. Topher loved his cousins, even if he did dwarf Juliette, who is almost 2 years old. She might be taller than him, but he is heavier and has a much bigger head. Whenever Topher would grab one of her toys, she would gently pry his fingers off of it, one by one, and by the time one hand would be free of the toy, the other hand would have already reached up to grab it. It was fun to watch them interact. It's funny how, at 2 years, a child is still such a baby. I mean, she could walk and babble, but we still saw her as a baby. Both girls were a lot of fun, and so kind to Topher. Saturday morning, we took Topher and Audree, 6, to the pet store while Regina and Justin ran some errands. Thanks for hosting a great weekend, Regina and Justin. We can't wait to do it again. I know I've been posting a lot of videos lately, but I just love watching my little baby laugh. In this one I took last night, he's discovering the magic of his bouncy ball for the first time. As soon as TJ gets done with work today, we're packing up and heading to Kansas City for the weekend to see my family. I can't wait for my sister, Regina, to see Topher because at his same age, her daughter Juliette only weighed 13 lbs (Topher is about 23 lbs now.) Topher can't wait to show everyone how big he has gotten! It's going to be a ball. I absolutely cannot get enough of that laugh. I hope it makes you smile, too. He's a rocket-ship. He's on the launching pad. The engines are rumbling and the smoke is billowing out from underneath him. In this video, he's doing it. He's really crawling. He can go through the motions, but you can tell that it's not quite clicking in his brain that he can really move himself around this way. All he's thinking about is getting to my shoes. But once that neuron fires, ignites, look out. He'll be ready for blast-off. Am I ready for him to take off? I really don't know. But either way, it's going to be quite a ride. Our tent next to Terry & Kathy's 5th wheel Topher had fun visiting with family members, rolling around on the ground, taking walks, swinging on the playground, watching the campfire, and taking a bath in the 5th wheel's shower. Swinging on the baby swing...careful, the straps are missing! Sitting around the campfire with Daddy Traditions are unbreakable in this family, and aunt Julie and uncle Chuck did not disappoint. Like every year, they turned their SUV into an air-conditioned tent. With the seats folded down, there's just enough room for an air mattress in the back. Chuck & Julie's car, modified And, like every 4th of July we have ever experienced at this Ewalu, IA campground, it rained all night. Topher went to bed late (around 11pm) and slept beside our air mattress in his pack 'n play. He woke up at 4am, cold and hungry. After feeding him and one failed attempt at putting him back in the playpen, we let him come to bed with us. And he slept between us until 7am, when he woke up for the day (and TJ and I both had an arm we couldn't feel anymore). Also, in true camping fashion, our air mattress had lost some air and our tent was leaking rainwater towards the foot of the bed but luckily the damage was minimal. It was a rainy morning full of flies, and after a couple hours of being awake, Topher took a three hour nap in the 5th wheel. When he woke up, it was time for us to hit the road for the 3-hour trip home. All in all, we were extremely proud of Topher. We couldn't believe he could sleep through that noisy rain rat-a-tat-tatting on the tarp of the tent but he did alright. I think we seriously wore our little kiddo out because not only did he take that 3-hour nap, but he took another nap on the way home, and ANOTHER one once we got home after taking his bath and helping mommy unpack the suitcases. It was a fun weekend, but I have to admit that we are very excited to sleep in our own solid bed (and crib) tonight. Happy first 4th of July, Topher! Squash, our kitty named for her famously flat Persian face, likes baby food. Go figure. She gets to lick the containers clean after Topher has finished his meals. So yesterday I simply couldn't pass up the photo-op of capturing Squash eating...squash. Talk about being cannibalistic. Wow, she looks kind of evil in close-ups. But she's really such a sweet kitty. So our kitty moment #1 refers to the following video. I was doing laundry when Squash came and jumped into the empty laundry basket and started poking her furry foot out at Topher. He loved it. Sorry about the little burp at the end. Topher hasn't quite gotten the hang of on-camera manners yet. He sure loves that flat-faced cat, though. Whenever he sees her during the day, he starts making a sound that is somewhere between a scream and a squeal. It's fun to watch his love of animals developing. Even though she's a little strange, we all love that kitty cat.